When we built our house, we made a conscious decision that our outdoor room would be an intimate seating area with a fireplace, but not a space that would function as an outdoor dining area. On the pool deck, we are using a 25 year old Brown Jordan patio furniture set that was given to us by my in-laws when they downsized, which includes a round table and chairs (seen on the left). We have plans to get new outdoor furniture at some point – maybe next year. I have noticed that we rarely sit outside and eat. I am not sure if this is because of our natural inclination to eat inside, or if it is because the table and chairs are enough of a distance from the kitchen that it is not easy or practical to carry the food out there. 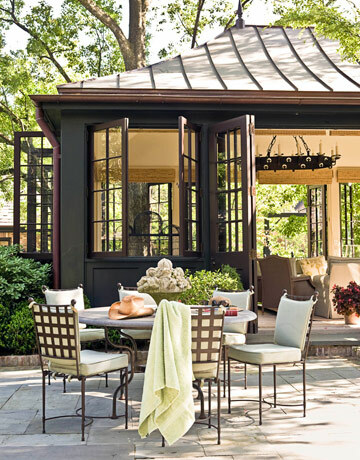 I love the idea of outdoor dining, though, and I have been pinning a lot of outdoor room ideas onto pinterest that feature outdoor dining rooms lately. We have a patio that is off the kitchen that is fairly empty (please forgive the state of the patio, it has been so damp and wet this summer, it needs a good pressure wash right now!). This space isn’t huge, and we tend to use it for entertaining when we have people over (we often set up a long bar on the far end), so whatever goes here must be flexible and light weight enough to move out of the way when we need the space. I think a round table would work well given the size of the space. A square table won’t work, as I need to seat at least 5 people (so that everyone in the family has a spot!). I could possibly do a rectangular table that seats 6. This picture appeals to me on many different levels – it has the style I like, and seating for six. I love the dark trim and light walls of the house, which is perfectly reflected in the color scheme of the stone floor and the dining set (which I believe is Janus et Cie Amalfi). Via pinterest. I have admired this picture many times when appreciating the kitchen in this William Hefner designed space, but only recently focused on the outside space – which also appears to be a Janus et Cie Amalfi chair and table set. It looks like a round table to me. Here is a view of the back of the house – the dining set can be seen behind the tree. This patio space is large, and has a seating area as well. Architecture by William Hefner. I have been a fan of William Hefner’s work for years – and he has a new book out called California Homes that I am very anxious to read (I have not ordered it yet). Click here to see on Amazon. This picture caught my eye because of the smaller size of the space, and the fact that the color scheme of the bluestone and house work well with the dark color of the dining chairs and table. I saw this picture on The Enchanted Home, and it still remains one of my favorites. Attributed to Ginger Barber. There is something about this picture that really captures my imagination. I don’t see many fully paved courtyards in Atlanta, but I remember them well from my childhood in Washington DC/Georgetown. 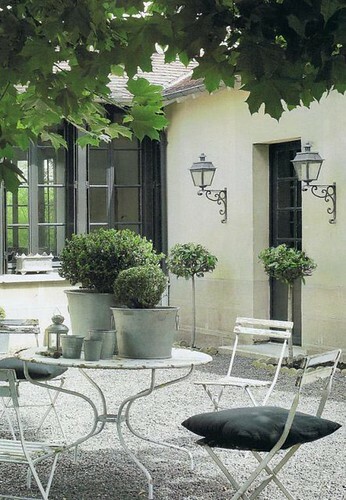 This is at a French Monastery, featured in Veranda, so does not reflect what an American back yard might look like, but it is such an inviting outdoor dining set up! 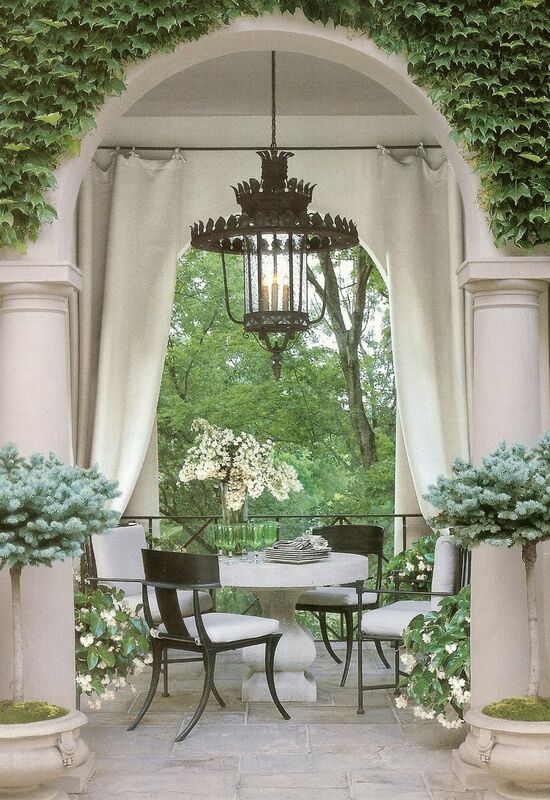 This has always been one of my favorite images of an outdoor dining room. The stone table surrounded by klismos chairs, and that unbelievable lantern, makes the most beautiful picture and is a lovely space. This house, designed by Bobby McAlpine, was featured in Veranda years ago, and this picture made the cover of the new book Veranda: The Art of Outdoor Living. It can be pre-ordered on Amazon here. John Saladino had a similar outdoor arrangement at his former home – teak chairs and a stone topped table. It would be wonderful to dine outside under the cover of the vines. 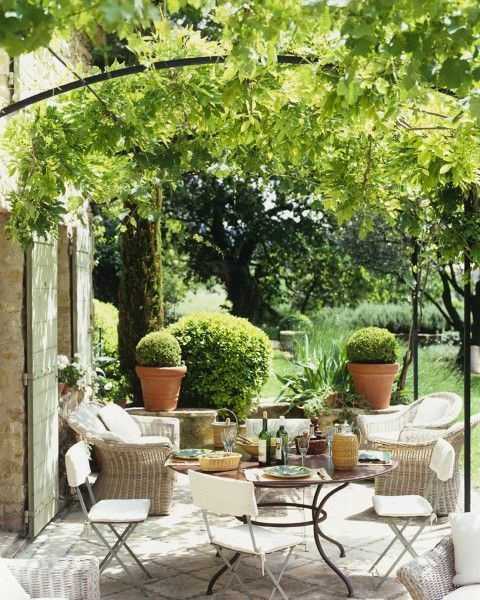 This is a pretty back yard, and I love the look of the teak dining table and chairs. Via pinterest, source. I also like the look of a French bistro style dining set – it’s effortlessly chic. 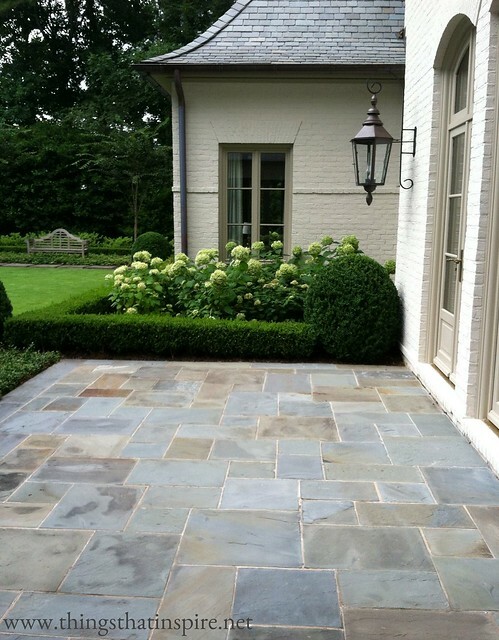 It looks particularly good on the pea gravel patio, don’t you think? Almost like it is in a Paris park. Another casual Parisian style set up. 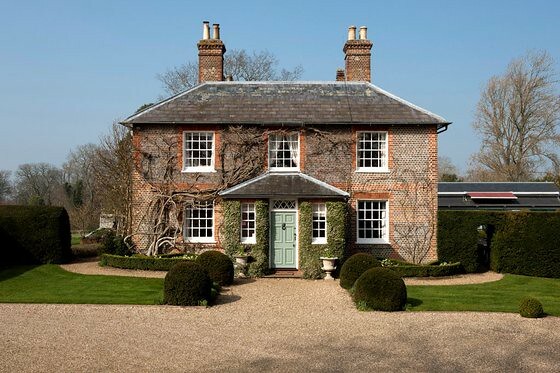 Since there has been so much royal news lately, I immediately thought about outdoor dining when I came across this picture of Kate Middleton’s parents’ home in Bucklebury. News reports indicate that this is where Kate, William, and the new prince will be spending time while the refurbishment on their new 20,000 square foot apartment at Kensington Palace is being finished. Notice the large outdoor table on the left side? It seems like this would be a wonderful place to eat summer dinners. Source. The view from the table is absolutely incredible – I would be eating out here every day! The Middleton home sits on 18 beautiful and private acres. Source. Based on the solar panel seen on the right side of this house, I think this is the front entrance of the Middleton’s Bucklebury Manor. It’s incredibly charming (I love the green door), and interesting to see the front knowing how deep the house actually is…the house appears like a cottage from this view. Source. Here is an aerial view of the house, which gives a great perspective on the house and its outdoor areas. Note that there are not just one, but two outdoor dining tables – one on the right, and one on the left side of the house. I believe these pictures were taken when the house was on the market last year, so it’s possible that the Middletons did not replicate this arrangement when they moved in. Do you have an outdoor dining area? 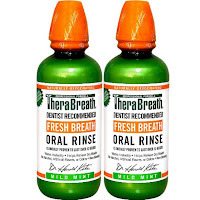 Any perspective on what works well, or any styles/brands to recommend? I love the look of the Janus et Cie Amalfi items, but I am not wild about dealing with the cushions – even if they are outdoor fabric, they will get dirty very quickly (although I read a great blog post on a couple who had custom cushions made with marine grade vinyl – brilliant idea!). I am also a big fan of many of the Brown Jordan outdoor furniture items. I love the idea of teak, but think it might just be too heavy for the space. The bistro table idea might be a bit too casual and small, although very light weight and flexible. Any thoughts are welcome! love the lightweight bistro furniture if it's not too informal for you. You could always dress up the table with a table cloth. They have some great and interesting colors too. We are having a gorgeous night here in Atlanta, this makes me want to eat outside! I like all of your ideas. I think the black iron and the white cushions would look perfect. If you want to do a bistro table, Ballard used to have some with cute Paris style bisto chairs. So cute and flexible, they fold and come in nice colors! Here is an idea. Move your round table by the pool to the patio area and see what you think about how it looks. Live with it there for a month and see if you use it. I have the Amalfi set and my area is right outside my kitchen French doors. The chairs are fine to sit on sans cushions. I only use the cushions when I have guests. Even in a covered area the cushions if left outside would get mold on them. I love Janus et Cie too and I also love classic teak dining sets for outdoors too! What ever you choose you have such a wonderful base to start with, anything will look fabulous! I love that "The Enchanted Home" picture and I think it's because it's an inside/outside scene. I feel like I can move around inside if I want, outside if I want bumping into people at the door. That's the way outdoor entertaining works at our house. The outdoor dinner party where we sat the longest was in a screened porch with the most comfortable outdoor chairs ever, spring chairs with a comfortable mesh back and seat. We talked and bounced on our chairs for hours. Still have good memories from that one. Loved the decor! It has such great finesse. The iron chairs with light colored cushions really look awesome. The small yard with lush lawn is just so perfect. Amazing pics!! I like your first choice and I too have seen the Janus et Cie without cushions and they look and feel great without the cushions. Save the cushions for special occasions or entertaining! If I'm not being too bold, would you share the color of the paint on your brick? I'm building a house in Louisiana and want to paint the brick and absolutely love your color combination of brick and window/door trim color. 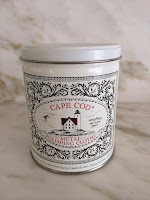 I love your blog and your home is just as beautiful as those of your inspiration pictures! Love outdoor spaces....we use our outdoor room all the time. Its become my favorite space. I think the key is to put comfortable furniture and create a space you are naturally drawn to going into..for me its my refuge, a place to enjoy coffee or a glass of wine and some good reading material! Holly, Since you would like to continue using the area for both dining and your bar area, I would use a rectangular table. The retangular shape would fit in the area when you move it back for the bar with less unusable space. Be aware of the table leg placement for optimal seating. 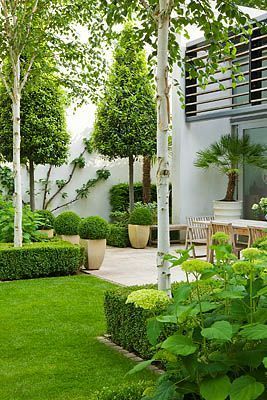 The chairs could be moved for more seating throughout your outside area when needed. I have an iron table and chairs which look nice with or without cushions all year round. The chairs have a slight spring in them that I have found everyone seems to enjoy, especially men! Am betting John Saladino had much nicer weather for outdoor dining in his Santa Barbara area home than you do in Atlanta. And issues like flies and mosquitoes not a problem for people in that area...there's a reason it's paradise! Don't blame you for not making outdoor dining space a priority there in your hot muggy part of USA. When I lived in San Francisco, pleasant cool temps made outdoor dining easy. But when I lived in Huntsville, AL ... not so much! Thoroughly enjoy your blog! We have our original kitchen set that was a very well made wrought iron glass top table on our back patio, It has a new coat of paint and cushions ,but 44 years later it is alive and well. We use it all the time and eat out there morning and night, it is an extension of our home. You can see it on my blog post. I have a home tour on my blog right now. We were young but we made a wise investment. I've loved seeing your patio evolve and I love the pictures you share! I do think it makes a difference if the area is easily accessible in order to truly use it…which is why we only use our outdoor eating area for parties! Plus it is always hot and humid! Anyway, loved this post and LOVED seeing the Middleton's estate…I could never get enough of this! Hope you are doing well, Holly! Saw an ancient stone barn in Scotland that had been repurposed into a home. The stone terrace off every back window & door was perfection. Not too large to easily have dinner, quick tea, work on the laptop from anywhere in the home. Small world Holly, I supposed French Essence used your pic too! Have put the proper link on. Thanks. A nice surprise how you brought Bucklebury into the post. Love the village. Hope they never move from there, we'll keep getting updates. I actually think teak would look great in your space. We have a small rectangular bluestone terrace off our kitchen & living room & used the Gloster oval expandable table & Gloster's Kingston dining chairs. We typically have the table set for 6 but it easily expands to seat 8 (perfect when our family of 4 invites another family of 4 over for a cookout). Our terrace isn't large but I don't think the teak looks too heavy at all. Authenteak on Huff has great selection on display & good prices. Forgot to mention that our oval teak table does double duty as bar when we have folks over for cocktails. We put it across far end of bluestone terrace (like your bar set up) and use a tablecloth. The table is very easy to move. I always look forward to your blog...Your terrace is similar to mine, and I love your first? choice. Just classy.Especially love your trim color on house. Could you possibly share the colors with us? Do continue to share pics of your home...it is so beautiful. Holly, I didn't know you grew up in DC. So did I. :) Between all the rain and humidity, we have done nothing outside this summer! Fun post...and I definitely think you are attracted to the Janus et Cie...so definitely investigate that. It would complement the look of your home for sure. So fun to see the Middleton's house...how interesting that the front looks charming, but the home in its entirety is truly imposing. What a relaxing place for Kate, Will to adjust to parenthood, away from prying eyes!! Let us know what you decide upon....you have excellent taste, so I know it will be beautiful!